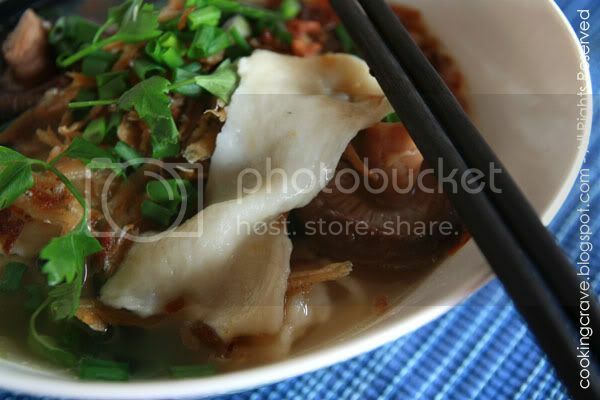 When I first tried this Mee Hoon Kueh or some call it Pan Mee, it was cooked by my mother in law. It was one of my mother in law's signature dish. My father in law, hubby, my brother & sisters in law they all enjoyed and love this Mee Hoon Kueh so much. This is one of my hubby’s comfort food and it is now becoming my kid’s favorite dish. To make the dough, just place all the dough ingredient into breadmaker and use the dough cycle to knead it. After the 30 min dough cycle is completed, place the dough in a bowl, cover with cling film & rest for about 1 hour. Mix water with salt, egg and oil until well mixed. In a large mixing bowl, add the water mixture to the flour and mix into a dough. Knead the dough for about 5 minutes, until the dough springs back a little when pressed with a fingertip. Shape the dough into a ball, cover with a clean damp towel or cling film and leave to rest for 1 hour. Boil 100gm of fried ikan bilis (keep 100gm of ikan bilis for garnishing) and tong choy in 1.5 litre water. In a wok with little oil, stir-fry garlic & mushroom until it's fragrant. All the fried mushrooms into the boiling soup. Let it simmered for few minute. Remove the cloth covering the dough and slightly flatten the dough with a rolling pin or using your palms, and then fold it over for a few times. Tear the dough into small thin pieces and drop it into the boiling soup. Repeat until the whole dough is complete. When the dough is cooked, add in vegetables. Season it with some pepper and salt to taste. Top with fried anchovies, fried shallot, some chopped green onion, coriander leaves & serve warm. To me, authentic mee hoon kueh should be torn into pieces by hand . The pinching of the dough seems to give it extra texture and make it taste better. I love the odd shapes mee hoon kueh!! I love this.....why don't call me go and eat. ha..ha..
my family favourite! i cook this at least once in a week, simply yummy. love your super delicious!! miss the handmake mee hoon kuih! I grew up eating this and I cook this often for my family now :) Yours look delicious! 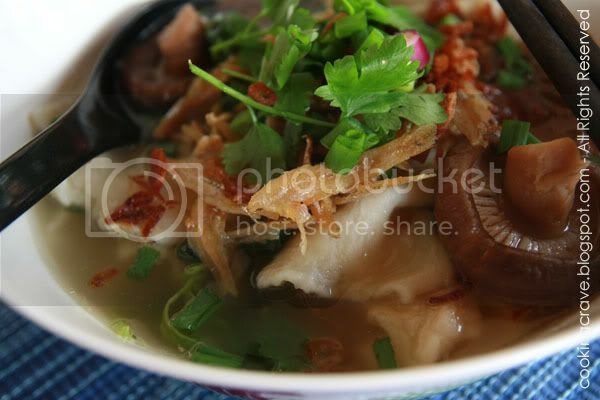 yummy yummy..lately i found a method to cook tis dish, i saw a stallkeeper 'pull'the dough in a pot of cold water before she throw into hot water to boil, the mee hoon kueh very soft n 'Q'..i wanna try tis too! 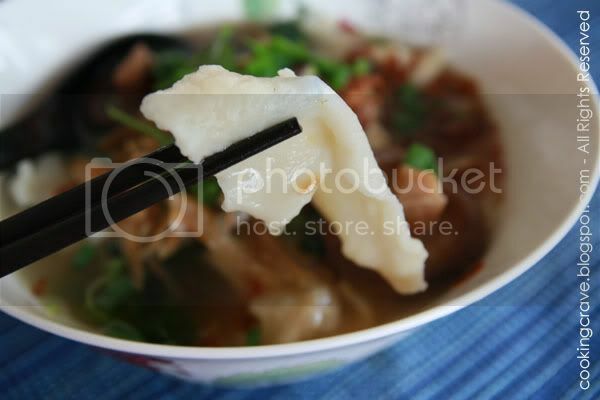 Ahh, good home made mee hoon kuih! 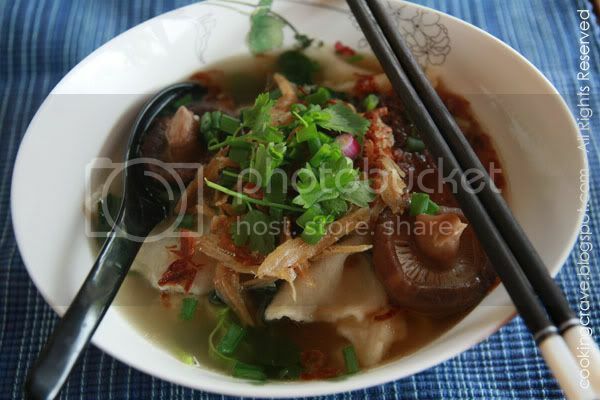 I prefer Pan Mien to Mee Hoon Kuih, but the soup broth is the key to these two types of noodles. hello there! thanks for the recipe! miss this very much as i live in melbourne. just wondering , how many people can i serve with this recipe? 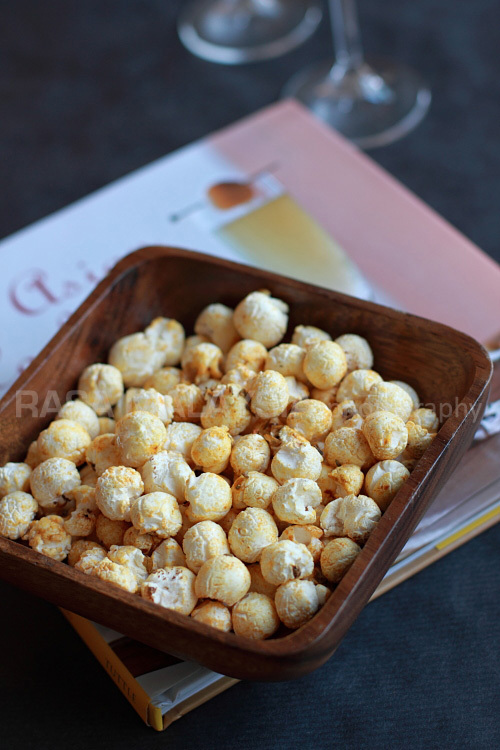 Yvonne : Thanks for stop by my cooking blog.. the recipes above served 3-4 person, normally I will double up the recipe to 500gm flour when I cook it :) Happy Trying! !